This is the plan. You can click through to Flickr to see it larger if my handwriting is hard to read. It's not all planted up yet, too early for some things. 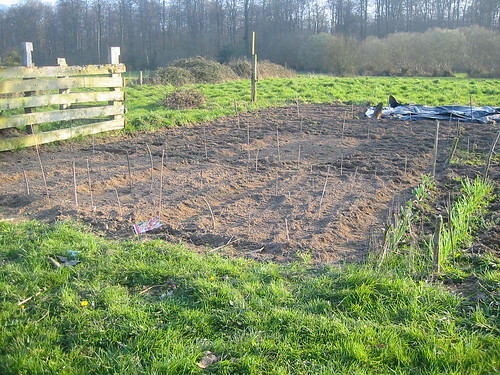 Mostly small beds, about 1m x 2.5m with earth paths between. 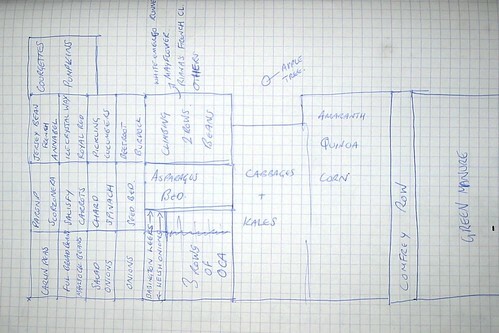 In fact, this part is pretty much the square metre garden writ large. The asparagus bed, Babington leeks and Welsh onions are in place from last year and growing on. I may move some or all of these in the autumn. Already in are the onions sets and today I planted the broad beans, peas, chard and spinach with short rows of Bronze Arrow lettuce and Long White radish (from home saved seed). If it all looks a bit vague towards the quinoa side that's because it is for now. I have to fit some field tomatoes and some other stuff in somewhere. I'm also not entirely sure which climbing beans to choose, the ones mentioned are definitely in, there are half dozen others that I can't make my mind up about but only room for a couple. The row of comfrey will be deprecated, to use a computing term, throughout the next year. It's useful green manure but in its present spot forms an artificial barrier I've decided we don't need. I'm going to split the plants and resite some, then cut these poor specimens to death over the summer before (attempting to) rooting them out entirely in the autumn. The green manure patch is in preparation for potatoes next year. I've decided on two crops of green manure with the plot being covered in November until planting time. I'm also covering some new plots along the edges of the existing cultivation to claw back some area after releasing the stony patch. Not shown, the perennial patch with rhubarb, Good King Henry, lovage, sculpit, tuberous peas etc. It's just off the edge of the screen on the right hand side. The potatoes are in a separate area this year and there is a small bed in the fenced back garden where I'm going to have a few plants for seed production, primarily the Irish Prean peas which were destroyed by deer last year. I meant to have a long philosophical bit about seeds, sowing and getting things done but I'm just too tired. It wasn't that interesting anyway. Here's what some of it looks like on the ground.